Newark, New Jersey: A new environmental organization is beginning in Newark. The City of Newark will join other Essex County municipalities by having a 'Green Team'. According to Sustainable Jersey, "Green Teams provide the leadership to develop plans, implement programs and assist with educational opportunities that support the creation of a sustainable community". 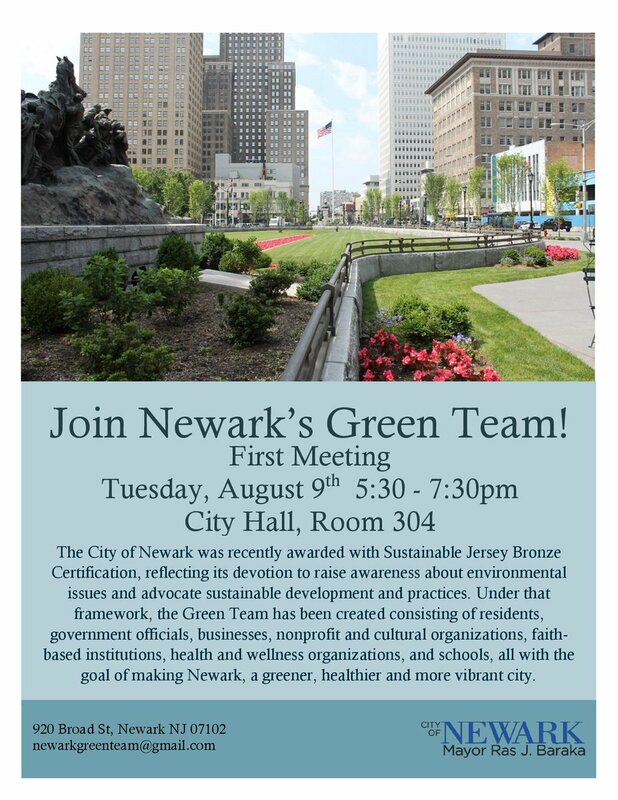 The city's Office of Sustainability reports that the Newark Green Team will have its first meeting at Room 304 in City Hall on Tuesday, August 9th, beginning at 5:30pm. Last month, the City of Newark announced that it is looking to hire a Chief Sustainability Officer who will work with the Green Team and the Newark Environmental Commission. Several local suburbs, including Maplewood, South Orange, Irvington, Millburn, and Nutley, already have a Green Team. Newark City Hall is located at 920 Broad Street in Downtown, and is served by NJ Transit buses.